Catch The T displays real time position data for the MBTA's Orange, Red & Blue lines. Other train systems and the Green line are not supported. See below for more information. Don't blindly wait for the T to show up. Instead, KNOW when it's going to be there. - When is the next train going to be at my stop? - Do I have enough time to grab a coffee? - Is there REALLY another train right behind this one? Sometimes, just knowing where the train is makes the wait feel shorter. CTT with show you the trains' current positions (by station), as well as prediction times for when the trains will arrive at other stations. The data is provided by the MBTA, and is available thanks to their open data initiative. The data for arrival times is powered by circuits on the train tracks, and is updated each time a train passes one of these circuits. This is the same system that powers the familiar audio alerts at stations (e.g. "The next train is now approaching"). Arrival times at the subsequent stations are predictions based on historical data. 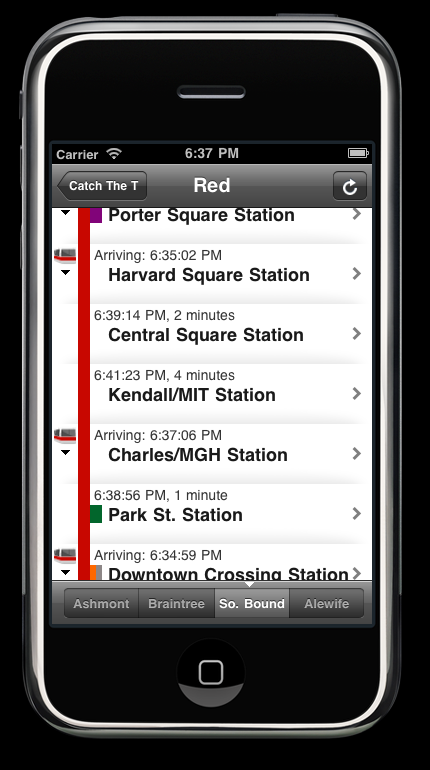 This app was developed independently and is unaffiliated with the MBTA. Data on the Green line is unavailable due to technical limitations beyond this app's control. The Green line doesn't have the same tracking system present on the other lines. Bummer, I know. The MBTA has stated that they are working on expanding this tracking service, but the Green will be several years out. Download Catch The T now and never miss a train again!